Even so, I was lucky to get it. A picture of the mask sent out in early December received a dozen replies within twenty-four hours, including eight or nine from galleries. This level of interest in an unknown artist’s work, especially at a time of year when sales are difficult, tells you all you need to know about the quality, even if you can’t judge it for yourself. It is a level of interest that, in fact, is almost unheard of. The design is arresting to the casual eye for a number of reasons, starting with the contrast between the black and red and the thickness of their lines, and continuing with the unpainted nostrils and the ovoid in the middle of the forehead like a supernatural third eye. On the right, the mask looks dark and brooding; on the left, carnal and scowling. The result is a mask with an unusual degree of presence. In terms of the northern school, the mask is even more interesting because it seems both traditional and contemporary at the same time. 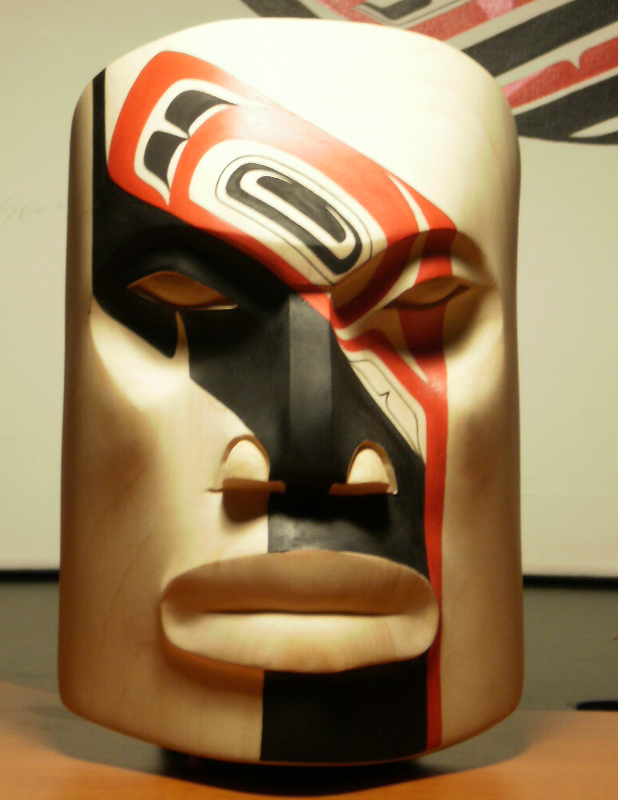 On the one hand, the shape of the mask is a standard one in Tsimshian art. The painting across the face without regard for individual features is also common in the northern schools. On the other hand, I have never seen paint applied in such an angular slash across the face to create such an asymmetrical, modern effect. You might almost say that the traditional and contemporary are at war across the mask – a suggestion of conflict that contributes to the strong sense of presence. Traditionally, naxnox was used to refer to the masks and regalia used in ceremonies. In Tsimshian languages like Sm’algyax (Coast Tsimshian), naxnox means “beyond human understanding.” Or, if you prefer, you might translate the word as “supernatural” or “spiritual.” Such works were often concealed when not being used, and, should they not be treated with the proper respect, were capable of extracting revenge. Obviously, Morrison’s mask is not naxnox in the literal sense, since it is meant to hang on a wall rather than being danced. Yet, metaphorically, the name seems to suit the mask’s presence and its mixture of the traditional and modern. I wonder: Could the meaning be extended to mean “psychological?” Or, more to the point, could it cover the latent power revealed in a first work? Although I’m not a linguist, I like to think that it could. Because, however you regard it, “Naxnox,” like Morrison’s “The Spirit of the Wolf,” is a work that holds great potential for Morrison’s future career.